Expand the Rooks and pull off the perfect crime in this guide to the best skills in Assassin's Creed Syndicate. 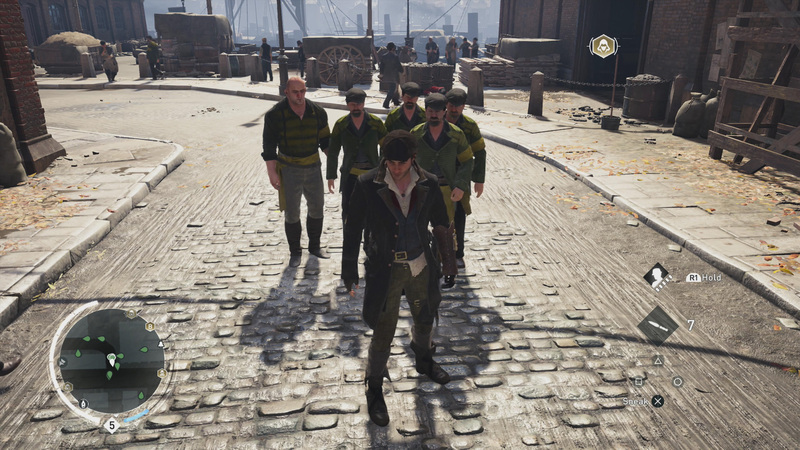 This guide will provide tips for players who wish to get better at Assassin’s Creed Syndicate. Whether you’re trying to expand the Rooks, pull off the perfect assassination, or determine the best skills to buy, we have you covered. We’ve put quite a few hours into the game already, and for the most part have left the learning curve behind. Spend a few minutes studying our advice, and you’re likely to find life in 1868 London is much better than when you first arrived. Eagle Vision is your friend, and players who are enjoying the console versions of Assassin’s Creed Syndicate can activate it by pressing down on L3 for the PS4, or Left Stick for the Xbox One. This will allow you to see items of interest in the environment, such as collectibles, unique kill opportunities, and of course the enemies that are within your range. Your first iteration of Eagle Vision will be basic, so it’s a good idea to spend a few Skill Points upgrading it when you can. You want to increase its effective distance, and even have it so that it will see through walls. To achieve this, you must buy Eagle Vision I, II and III. Once you hit that point, you can often pinpoint the location of every target in a single area, allowing you to monitor their movements and plan your attack. The Rooks can be your biggest weapon if you know how to use them properly. The Rooks are a gang that was started up by the two protagonists in Assassin’s Creed Syndicate, Evie and Jacob Frye. As you start to clear out rival gang leaders throughout London, you’ll see more and more Rooks roaming the streets. You can even recruit them to follow you into battle, or tell them to attack a target. They also have a skill tree like Jacob and Evie that falls under the Gang Upgrades heading, and the more you spend on them, the more useful they’ll become. The benefits of the Rooks are endless. Not only is traveling the streets a much easier task when they are in control of an area, but you can use them as a diversion. Recruit a handful, and then order them to attack the front door of a target building. When the enemy comes out to fight your thugs, find an alternate way to sneak inside the building and accomplish your mission. If you buy the Police Bribes and Notoriety upgrades, the fuzz will leave you be, as will the Blighters. You now own the streets of London. Cool story. After taking our own advice we entered an assassination mission at one of the train stations in London. We recruited five Rooks who were level 7, and instructed them to attack the enemy. They wiped out the entire enemy force except for our main target, who of course was dead in the water without their thugs to protect them. In most cases, the Rope Launcher is actually a faster way of travel when in London. 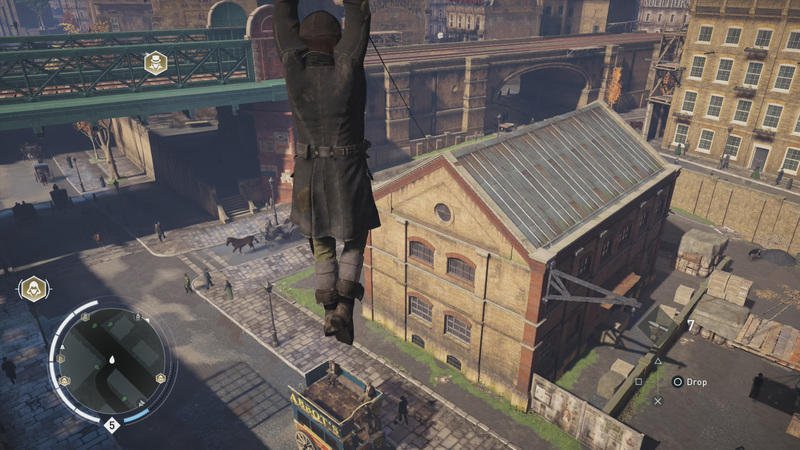 The Parkour in Assassin’s Creed Syndicate is on par with the standard set by Assassin’s Creed Unity. That is to say, it’s okay, but you’ll find yourself moving left when you wanted to go right, and bouncing off of a wall when you wanted to climb it. The parkour glitches don’t stop there. They will eventually annoy you, which is why the Rope Launcher is your friend. The Rope Launcher is one of the parkour mechanics that works really well, and given the ridiculous load times of fast travel (and the process in general), it’s an ideal way to cover great distances. For the most part, just move to the edge of a building or perch, and then look at where you want to go. This might be a pole, or another building across the street. If that area is in range, you’ll get a prompt to press L1 for the PS4, or Left Bumper for the Xbox One. It’s also a great way to get out of trouble when you are outnumbered by high level enemies. If you’re having trouble finding a point to fire your Rope Launcher at, aim your pistol in that direction and it will often give you the option to deploy the device. 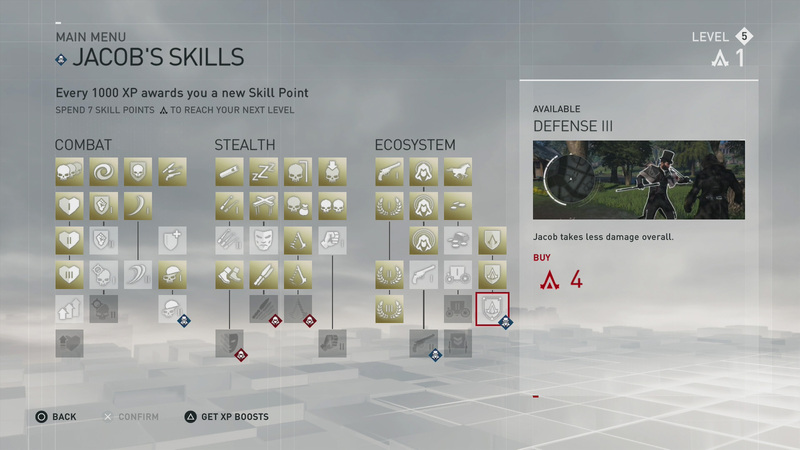 Evie and Jacob both have unique skills that fit their personal assassin styles. Unlike Assassin’s Creed Unity, you’re going to be playing as both Jacob and Evie Frye. Each of them are given their own skill tree, but they earn Skill Points together. This means that if Evie earns a point, Jacob gets one as well, which really reduces the leveling grind. You can play as Jacob for several hours and earn loads of Skill Points, and when you switch to Evie she’ll have the same rewards as her brother. Within their respective skill trees are skills that are specific to one character or another. For Evie, you can choose between Chameleon, Knife Master II, and Stealth III. These are all valuable, but Chameleon might be the winner among three strong contenders. It allows Evie to become invisible when she’s stationary, which means you’ll never have to worry about cover again. For Jacob, you get a choice between Mutilate II, Gunslinger II, and Defense III. The winner here is clear, as Defense III means Jacob takes significantly less damage from enemies, which is beneficial given his love for a good brawl. It also means he’s tailor made for the Gang Wars you’ll find yourself in, or any situation where you might be grossly outnumbered. You'll need to loot chests in order to find the supplies needed to do any crafting. 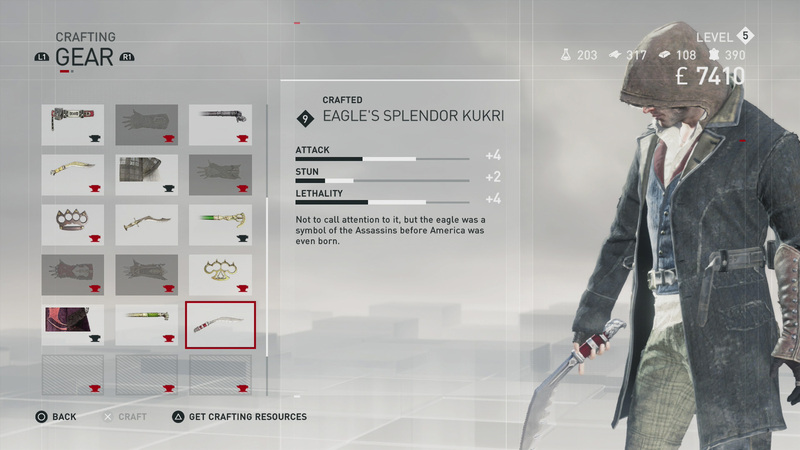 The Crafting in Assassin’s Creed Syndicate is fairly straightforward. Players will find materials that are needed for crafting in the chests that are around London, and can use the Crafting menu to upgrade their current gear, or craft new gear. It’s easy to overlook crafting, but players should be mindful of it. Your level means a lot, but you also need to have potent weapons that deal more damage. Whenever you have a pocket full of cash, take a look at what you can craft. We prefer to craft items that have increased Lethality, ending fights faster and letting us get back to the safety of the rooftops. Oh, and leave no chest unopened in London, otherwise you’ll find that you lack the materials required to craft anything at all. Those five tips should be enough to get you started. You can always learn more by visiting our Assassin’s Creed Syndicate Walkthrough and Guide. Tagged with Guides,	Ubisoft,	USgamer. Unlock the platinum trophy in Assassin's Creed Syndicate and get all those Xbox Achievements in this complete guide.